Attention all ECS FC supporters, it’s derby time once again! 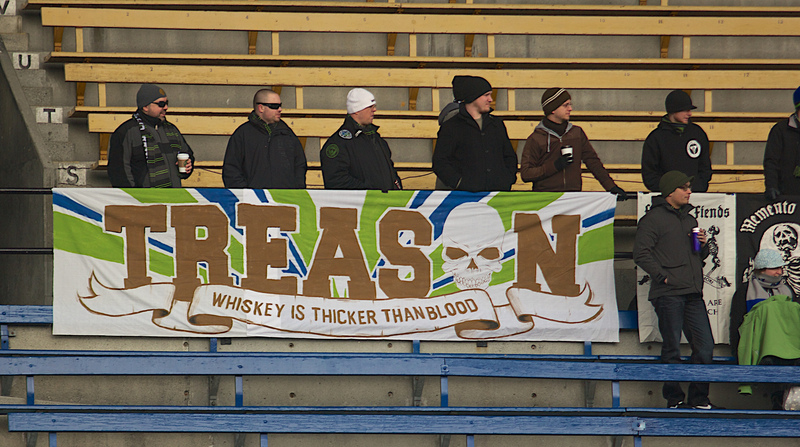 ECS FC Green is up against Finn Hill United this Sunday, aka the “Treason and Betrayal Derby.” Finn Hill is a long time rival of our club, due to the fact that their captain/mgr Michael Montgomery (aka Burnsie) is a veteran ECS member. These high-intensity matches are always a favorite amongst players and supporters, often resulting in numerous cards and most of the time, victories for ECS FC. Folllowing an undefeated championship season in D3, Green was promoted to D2. Back in the same division as Finn Hill, ECS FC Green is eager for the chance to play against a long time ECS FC rival once more. Although early in this Winter GSSL season, Green has already had a strong start, currently in 2nd place with 5 points. Finn Hill has not had quite the same success so far, right now in second-to-last place with just 2 points. Finn Hill United is no doubt looking forward to the opportunity for a bit of revenge. Relegated to Division 2B last summer, they had a chance at the division title but their last match of the season against Green, (a 2-0 ECS FC victory) robbed them of the championship. This season Finn Hill will have the displeasure of going up against two ECS FC teams. Black will play Finn Hill in a couple weeks on February 9th. So come out to Georgetown Playfield this Sunday at 11:15am to support ECS FC in this important match up (and heckle Burnsie.) Bonus: Show up early to catch Black in their match against Stonewall FC at 9:30am on the same field! Take Em All! Support the supporters!